"I think the dam is about to break on Benghazi. We're going to find a system failure before, during, and after the attacks. "We're going to find political manipulation seven weeks before an election. We're going to find people asleep at the switch when it comes to the State Department, including Hillary Clinton. "The bond that has been broken between those who serve us in harms way and the government they serve is huge — and to me every bit as damaging as Watergate." The post links to a Washington Post column by Marc A. Thiessen on the Benghazi whistleblowers. A number of major news stories have broken in the last week about the attack, including the news that a team of U.S. Special Forces that was preparing to respond to the attack was told to stand down by the U.S. Special Forces Command Africa. 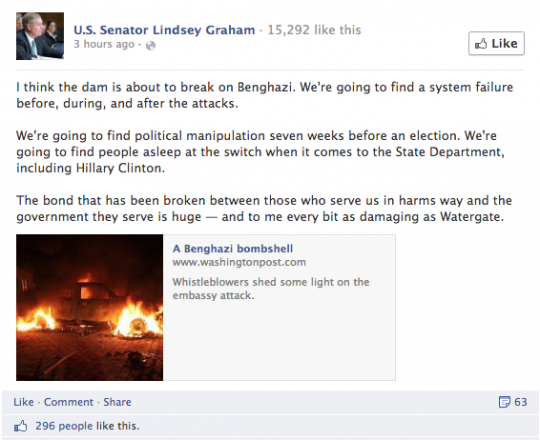 Watch Graham talk about the unanswered questions in the Benghazi investigation on Fox News here. This entry was posted in National Security and tagged Benghazi, Congress, Hillary Clinton, Lindsey Graham. Bookmark the permalink.